When Kyo was born, his mother loved him but was afraid of his true form. She reassured him that she loved him very much but she constantly checked to make sure that he was wearing his bracelet. This led young Kyo to believe that she wasn't being honest about her love for him. At some point, Akito (with Shigure) arrange to see Kyo's true form. Akito removes his bracelet and is absolutely repulsed by what she sees and smells. She tells Kyo that he's disgusting. 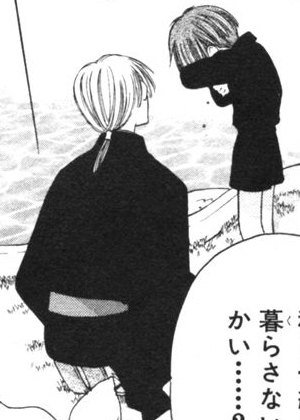 Sometime later, when Kyo is playing alone in the park close to the main Sohma complex, he met Kagura. Kagura asked him if he liked any tv shows and Kyo sadly said he wasn't allowed to watch it, else his mother would become angry with him. Kagura felt sorry for Kyo and seeing how her life was better than his, she offered to play with him and stay by his side. This made Kyo very happy but unfortunately, his true form was revealed to Kagura and his mother wouldn't let him outside anymore. 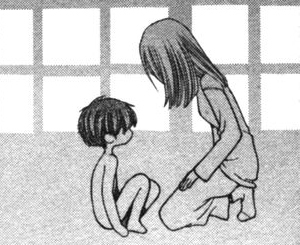 When Kyo was about four or five years old, his mother couldn't take it any longer and committed suicide. She left a note saying that she couldn't handle being around Kyo and that if he was born as the mouse, at least she might have been at least a little happy. People started talking about how it was Kyo's fault that she died and that Kyo didn't even cry when he found out that she had passed. His own father began to blame Kyo for her death, yelling at him at the funeral that he should feel remorse for what he did because his mother loved him very much. Kyo lost it and screamed that it was Yuki's fault and that he'd kill Yuki and then himself, if that's what his father wanted so badly. Immediately afterwards, Kyo was approached by Kazuma. Unable to take it anymore, Kyo cried and yelled that it wasn't his fault that his mother was dead. Kazuma simply smiled at Kyo, said that he understood and asked Kyo if he would like to come live with him. He told Kyo that he lived at the dojo and Kyo would be able to train in martial arts if he came. Kyo agreed. It didn't take much time before the two became to bond as father and son. If Kazuma had to go out alone, young Kyo would cry; when Kazuma took Kyo with him, he would hold his hand or pick him up and carry him on his shoulder. Occasionally, they'd overhear people gossiping about how it wasn't fair that Kazuma had to care for Kyo since Kyo's own father couldn't even discipline him… but Kazuma would embrace Kyo to show them that he was really cared for. Kyo also began training in martial arts, as promised. He would train with Hatsuharu, even helping the younger boy better learn their techniques. Occasionally, Rin would come by for a few days at a time and Kyo would become jealous, feeling she was monopolizing Kazuma's time. They'd both stare at each other angrily for several minutes at a time. At the new year's celebration, Kyo is standing outside the building where all the zodiac members are gathered. He's out there all night and for the first time, Yuki comes outside to meet him. Kyo immediately tells Yuki that, as the rat, it's his fault that Kyo has suffered and that it'd be better if Yuki had never existed. He then runs off. Yuki later sees him going to the same elementary school as Hatsuharu and Momiji (Kagura also joins them, flustering Kyo) and begins to envy him for his inclusion with the other zodiac members. One day, Kazuma buys Kyo a blue hat that Kyo himself had picked out. Unfortunately, it later blows off Kyo's head and as he chases after it, Yuki catches it. Feeling that the hat is now contaminated after Yuki handled it, Kyo tells him that he doesn't want it anymore. After school, Kyo often found it difficult to immediately return home so he would linger behind in a nearby park. This is where he meets Kyoko for the very first time. When she sees him sitting alone, she comes over and asks him if his hair colour is natural; Kyo loses his temper and asks what it matters, telling Kyoko to not act so formal with him. xD Kyoko finds this super cute and asks where his parents are; Kyo tells her that his mother is dead and that his father thinks he should also be dead. Kyoko's expression softens and says it must be lonely for Kyo. She introduces herself as Kyoko and Kyo -- likely because he's embarrassed to the similarity of their names -- refuses to give his name to her. She calls him Jari and they meet quite often, Kyoko telling him about her life and about Tohru. Every now and then, Kyo would see Tohru and Kyoko together on the street and to him, they always seemed happy. When Tohru's father passed away and Kyoko became despondent, it was the only time Kyo ever saw Tohru looking sad as she ate dinner alone at home. He came to find himself thinking about the two very often, frequently wondering if they were happy or sad that day. One day when Kyo comes to visit and meet Tohru, Kyoko tells him that Tohru has gone missing. Kyo, seeing her cry, tells her that he promises to find her and protect her. 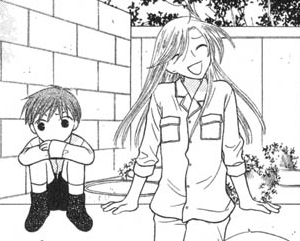 As he is running through the neighbourhood, Kyoko later comes up to him to tell him that Tohru had been found. She says a boy with a blue hat had led Tohru home; Kyo recognizes the hat as his own and that Yuki had been the one to save Tohru. He becomes upset and tells Kyoko that despite having saved Tohru and being well loved by others, Yuki is a bad guy. When Kyoko asks why it bothers Kyo so much; he's such a kind and gentle kid that he shouldn't worry so much. Kyo becomes flustered and doesn't know how to react so he runs away and doesn't see Kyoko again until his teenage years.